In our office we treat those patients with Obstructive Sleep Apnea (OSA) with oral appliances to reposition the jaw.. We will also discuss some of the more common therapies.There are numerous treatments out there and promising ones on the horizon. The goal of these treatments are all to find a means to eliminate the obstruction that is present and to provide a healthy Oxygen intake. In addition the body needs rest to produce hormones and regulate important physiological functions such as blood pressure . 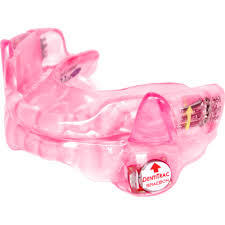 This is generally the first line of defense against Sleep Apnea. It is the “Gold Standard” for care throughout the world. 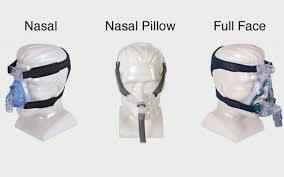 When we have a newly diagnosed patient or a patient already wearing the CPAP we highly promote its use. Basically it provides a an air stream to push the obstructive tissues out of the way allowing air to flow to the patients lungs. The flow can be continuous (CPAP) or in synch with the patients breathing (Bi-PAP). There are many variations on the market. Once fitted with a CPAP device the patient undergoes another sleep study. This time they wear the CPAP while the flow of air is adjusted (titrated) until a healthy reading is seen on the sleep study graph. This can be done at home or in the lab. When worn regularly CPAP therapy is 100% effective. Documentation shows improvements in Blood pressure, heart health, moodiness, tiredness, and alertness all go hand in hand with successful CPAP. Unfortunately CPAP compliance is a huge problem . 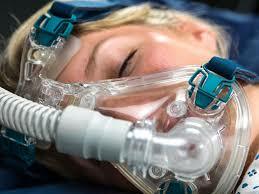 Estimations run as high as 35% for those that do not sleep a full night with their CPAP unit. Whether it be dry throat, cumbersome, claustrophobic, travel , or desire, there are a million patient excuses for not wearing CPAP. The good news is that there are newer versions of the units on the market every day hoping to provide a CAPA that patients will wear. The bad news is that patients get little benefit from periodic use. There are various surgeries that can be performed to eliminate anatomical obstructive tissues. Tonsils and adenoids removal are a well known procedure that is often done on youth with Apnea. Uvulopalatopharyngoplasty (UPPP) seen in the picture above is another such surgery. It should be noted that these surgeries are not always 100% successful and may require a second surgery and or the use o CPAP. Electrodes of a specific frequency or lasers may be used as a less painful and less invasive procedure to remove undesirable tissue. 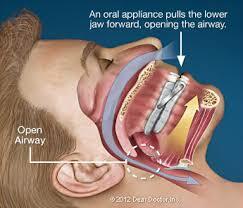 It is not as successful as the previous treatments and is generally only used for mild Sleep Apnea. This is a brand name of an interesting new technique. 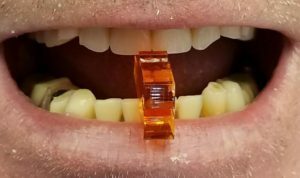 An implantable device is placed near the nerve that controls the tongue and breathing muscles The breath is monitored and it stimulates the patient to breathe when needed. There are many more therapies available to treat Sleep Apnea. Some better than others. Some the jury is still out on their longstanding success at treating Sleep Apnea. the first step a patient should take is changing their lifestyle . Weight loss, decreased alcohol, sleep position, all have an effect on sleep apnea. Most importantly they need to get diagnosis from a sleep MD. 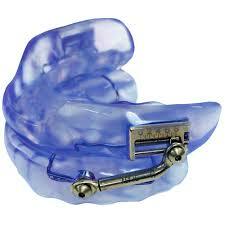 Oral appliances for treatment of Sleep Apnea can only be made by a Dentist. The condition of the mouth must be healthy , and evaluation for TMJ disorder , periodontal disease and need for Dental work are all paramount to making a successful appliance. In our office we screen all patients for sleep breathing disorders and snoring. When we suspect a possible Sleep Apnea do our best to educate the patient and convince them to have a sleep study. Diagnosis of Sleep Apnea can only be made by a specialist in Sleep Medicine. 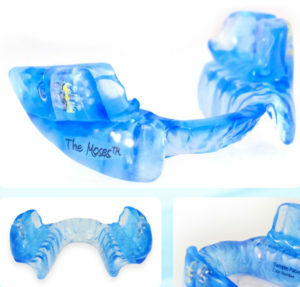 As we mentioned the same type of appliance is used to help eliminate snoring issues. We insist that all Snore treatment patients go through a screening and a home sleep test to avoid ignoring a potentially life threatening disease. 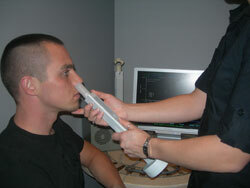 We use this device on both nostrils to check for any nasal obstruction. If it is severe we may have to refer for treatment by an ENT prior to treatment. If there is an obstruction it will contribute to snoring, and determine the appliance we should use. If we are placing an appliance in someones mouth who already has breathing issues it is very important that they can also breath through their nose. 3. Complete oral and extraoral exam to evaluate the anatomy to determine the appliance best suited for each patient. Lets look at an actual case. 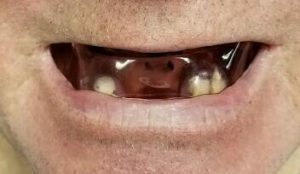 This patient had an upper denture and we can still make him a comfortable appliance. We needed something that would stay in the mouth all night and place his lower jaw in the predetermined position to open the airway.We then use our technology and take a bite record to open the bite to the most effective position. 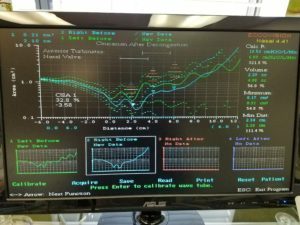 We use a George gauge to set the patients bite that can be mounted on a model for the lab to fabricate an appliance. We confirm our measurements with a bite jig and take photos and models for future reference. The appliance is made to this position and fitted comfortably for the patient to wear at night. It is important here to understand how an oral appliance works. 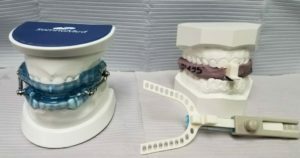 Basically through opening the patients bite and moving the jaw forward we can hopefully alter the tissues and decrease or eliminate the obstruction which is limiting air intake. This is not the final visit. 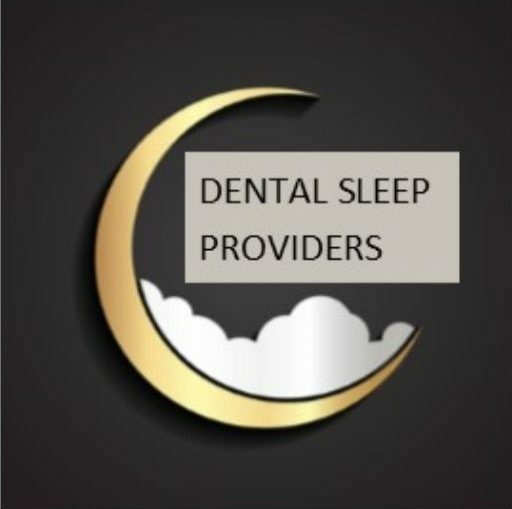 In order to guarantee that our device is actually treating the sleep apnea we have the patient return in 6-8 weeks and once we have done our best we return the to the Sleep Doctor for evaluation. They will let us know our level of success and if any adjustments are needed. The most important step following successful treatment is to return the patient to the referring Doctors and Sleep Specialists to evaluate our results. We can then work together to maintain the patients health and monitor their Sleep Apnea.